Video conferencing is undeniably popular due to its connection capabilities and “in-person” meeting advantages. 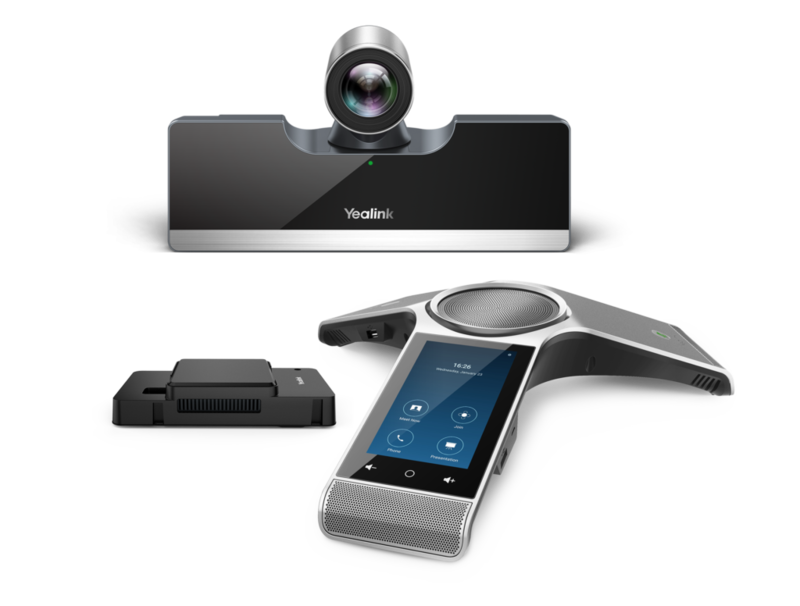 To continue leveraging on the need of video conferencing, Yealink has released total video device bundle solutions for Zoom Rooms. Zoom Rooms is the original software-based conference room solution, heavily utilized worldwide in various sized conference rooms, executive offices, and classrooms. Zoom has led modern enterprise video communications by providing an easy, reliable cloud platform for both video & audio conferencing, collaboration, chat, webinars, and more. Yealink will now offer customers a bundle that pairs Yealink hardware (computer, camera, audio devices, and controller) with Zoom software. Yealink is now customers’ one-stop for full Zoom solutions, with four different bundle options (released throughout ’19) ideal for training, large, medium, and huddle rooms. Additionally, there are a handful of Yealink OpenSIP phones for Zoom Phone, including the renowned T4S series and innovative CP960 conference phone. It is advantageous to utilize a Zoom Room with Yealink. But why? Originally, Zoom Rooms hardware solutions (Gen 1) ran with an iPad and conference phone; however, more hardware was eventually needed (Gen 2). At this point, users needed not only a conference phone to integrate control, microphone, and speaker functions, but the conference phone required multiple cables for deployment. Yealink’s version (Gen 2.5) is a one-cable solution on the. The Yealink CP960 eliminates the USB cable that was originally needed to cross from the TV stand to the conference phone table. The reduction of this unsightly cable and layout issue have greatly simplified deployment. The Yealink solution is not only compact in cabling, but also in hardware. One CP960 device will act as the Zoom Rooms controller, speaker, and microphone, freeing up the conference table from technology clutter and overload. Users are still able to leverage the power and audio benefits of the CP960 wireless expansion microphones (if needed). The CP960 is further enhanced by Zoom Rooms with full integration of the UI. The CP960-Zoom Edition integrates the Zoom Room controller app, allows for mute/volume sync, controls the PTZ of the Yealink UVC camera, and also controls meet now/join meeting and presentation. The Yealink bundles are not solely comprised of the CP960. The mini-PC package is comprised of a small PC with preinstalled software. The mini-PC includes Windows 10 Pro or IoT Enterprise OS and the necessary license. Also included is the Yealink plug-in for Zoom Rooms and the app, which again, make deployment and setup a breeze. Two UVC camera options are available: the UVC80 and UVC50. The UVC80 is ideal for large rooms with its 12x optical zoom camera, while the UVC50 is better suited for medium rooms and features a 5x optical zoom camera. All Yealink UVC cameras are UVC1.1 compatible and plug-and-play. When paired together, Zoom Rooms and Yealink are a great option to offer new customers, users who have a CP960 and want to convert to Zoom Rooms, or users who want to use their computers and have yet to try a CP960. No matter the scenario, there is a reason for end-user customers to embrace these new video conferencing bundles. For more information on Yealink video conferencing solutions or Yealink distribution, contact the 888VoIP sales team at 888-864-7786 or by emailing the team directly at [email protected]. Yealink bundle samples are expected to be released end of March 2019 with more information rolling out soon. The post Why Yealink Video Conferencing is Even Better with Zoom Rooms appeared first on 888VoIP.